Many may know that we have a new County Historian, William Loveday, Jr.. I am pleased to post the following article that he has kindly contributed to our web site. It was his first published piece as County Historian which appeared in the SUNDAY LEADER-HERALD, January 13, 2002 on page 8A. Prior to the 1700's the land which now constitutes Fulton County was, for the most part, pristine and unsettled by Native Americans or European colonists. Centuries of use by the Mohawk Indians for hunting and fishing for winter food stocks and for travel to and from the Champlain Corridor and Canada had established their territorial rights and the use of the land in the eyes of other tribes. There had been no settlement or exploitation of the land and it's resources in any way. However, this situation was about to change with the influx of restless settlers from New England and the Hudson River Corridor, who came in search of land for their farms. In order to satisfy this demand for land and to further the development of the Colony of New York, the British Government of New York, together with group and individual land speculators, started purchasing large tracts of land from the Indians for resale and profit. Unfortunately, Native Americans had no concept of land ownership and were often victims of fraud at the hands of those speculators. Official and legal ownership of these purchased tracts was sealed with official approval issued by the Crown Government of New York through grants and patents. The first and probably most infamous purchase of land that would eventually become part of Fulton County was made by Attorney General of the British Colony of New York, Samson Broughton, in 1704. Broughton purchased 700,000 acres for small compensation from the Mohawk Indians. The Mohawks, who thought they were just selling enough acreage for one farm, were understandably irate over the deception, but were never properly compensated for their loss. This tract, a small amount which included the present towns of Broadalbin and Perth, was called the Kayaderosseras Tract. The patent for this tract was issued by the New York Government to Naning Hermanse and 12 friends, the first of 23 grants and patents to be issued for land now located within Fulton County. Because the anger of the Mohawks was so great, no settlements were made within this huge tract until after the conclusion of the French and Indian War in 1763. In 1723, the Stone Arabia Patent, consisting of 12,700 acres covering part of what is today Stone Arabia, Ephratah and Oppenheim, was issued to 27 German Palatine families, most of whom settled in what is today Stone Arabia. On June 23, 1753, the well-known Kingsborough Patent was issued by the Royal Colonial Government in Albany to Arent Stevens and others. The patent covered 20,000 acres of prime forest land which had been purchased from the Mohawks in 1752 for the absurd price of "3 pieces of showde (shoddy wool), 6 pieces of gailing linnen, 3 barrels of beer, 6 gallons of rum and a fatt "beast". The Kingsborough Tract and Patent included parts of what are today the towns of Johnstown, Mayfield and Ephratah and the future sites of the cities of Johnstown and Gloversville and the village of Mayfield. Historians believe Arent Stevens was simply an agent for Sir William Johnson, as Johnson soon owned the complete Kingsborough Patent. In 1762, Johnson began building his hall within this tract at John's Town (named for his son) and soon had a thriving hamlet consisting of 600 Scotch immigrants he had convinced to settle in and around Johnstown, as well as a few German and Dutch families. In 1786, a group of New Englanders bought land within the Kingsborough Patent which had been confiscated from the Johnson family at the end of the Revolutionary War from the newly formed New York State Government and appropriately named their settlement Kingsborough, a community that was to become the seed for Gloversville. In 1683, an English Colonial law was passed making Albany County one of ten counties in the Colony of New York. The other 9 counties were strung out along the Hudson River. On March 12, 1772, the huge County of Albany, which included what is today Fulton County, was broken off into three large counties: Tryon, Charlotte and Albany. Johnson was the primary instigator of this redrawing of boundaries, seeing the need and advantage for bringing county legislation and control closer to home, specifically his home. Tryon County was named for the Royal British Governor of New York, William Tryon, and Charlotte County in northeastern New York was named for the wife of King George III. The Tryon County seat was placed at Johnstown because of Johnson's influence, and he thereupon had the famous county Courthouse and Johnstown Jail built in 1772 for the Tryon County legal matters. Prior to this, all legal business required a trip to Albany. Tryon County, which included all of today's Fulton County, was made up of five large districts -- not towns-- named Mohawk, Stone Arabia, Kingsland, German Flats and Canajoharie. In 1773, the Stone Arabia District was renamed the Palatine District. The eastern boundary of Tryon County was a straight line running north from the Delaware River, through what is today Schoharie County, along the eastern limits of what today are Montgomery, Fulton and Hamilton counties, and north to Canada. All land west of this line in New York was considered Tryon County. With Johnstown the county seat of this huge area, and with the State Road running from the valley through Johnstown to the Black River country in the west by 1806, and with a developing leather industry and trade, the Johnstown-Kingsborough area rapidly grew and flourished on the frontier. The name Tryon was removed from the county on April 2, 1784, by the newly formed New York State Legislature because of resentment for the previous Tory governor Tryon and was renamed Montgomery County in honor of Gen. Richard Montgomery, who was killed in the Patriot attack on Quebec early in the Revolutionary War. The eastern border of this renamed Montgomery County was redefined in 1788 as "all of that part of the State bounded on the east by the Counties of Ulster, Albany, Washington and Clinton, and south by the State of Pennsylvania." Although not stated, the western limit of Montgomery was still the western border of the state, and the northern border was still Canada. Washington, Clinton Saratoga and other counties replaced the old Charlotte County when that name also became repugnant to the Patriots. Also in 1788, all of the previous districts were now called towns, with the Mohawk district divided, forming the two towns of Caughnawaga north of the Mohawk River, and the town of Mohawk south of the river. In 1789, Montgomery County was reduced by the formation of Ontario County to the west, and in 1791 by the formation of Tioga, Otsego and Herkimer counties. In 1817, the new western line of Montgomery County was moved eastward to the East Canada Creek. In 1827, the town of Palatine was divided into two parts, with the northern part becoming the town of Ephratah. In 1817, the opening of the Erie Canal signaled change, as the prosperity enjoyed by the northern part of Montgomery County was gradually challenged by population growth in the Mohawk Valley area. In 1836, a petition by the people in the valley area to have the county seat switched from Johnstown to Fonda was approved by the legislature because "the old county seat in Johnstown was no longer central to the population of the county." Removal of the county courts and offices from the location of their origin in Johnstown to what northerners considered an "upstart village" generated a great deal of dissatisfaction in the northern part of Montgomery County and resulted in a petition to further divide the county. Judge Daniel Cady of Johnstown was the leader of the separation movement. A legislative act creating Fulton County (named after Robert Fulton of steamship and Erie Canal fame) was passed on April 18, 1838, and the present boundaries of the county were fixed. 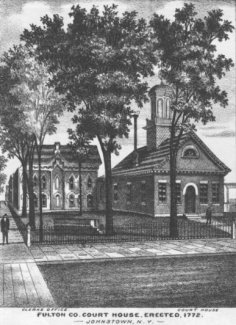 After the county seat was moved to Fonda in 1836, the Fulton County Courthouse and Clerk's Office had been sold to Joseph W. Farmer of Rockwood for $1650 and the jail to Elias Prindle of Johnstown for $390, but thte1838 act stipulated that these buildings must be repurchased by Fulton County for the same amounts they were previously sold for and put back into use within the county seat of Johnstown. There were still a few internal changes to occur within the new Fulton County borders subsequent to it's formal establishment in 1838. Among those changes, on April 11, 1842, the town of Caroga was formed from portions of the town of Johnstown, Stratford and Bleecker. Also in 1842, the town of Perth added a portion of the town of Broadalbin to it's northeastern side. Fulton County was now formed as you see it today, with the county seat returned to Johnstown, near the center of the area's then-flourishing industrial and farming communities. After the many formative years leading to it's creation, the county was finally poised for the many years of growth and prosperity that were to follow. Copyright �, 2002 William Loveday, Jr.